To men’s adventure magazine collectors, Eva Lynd is best known — by sight if not by name — as a favorite model of artist Norm Eastman. 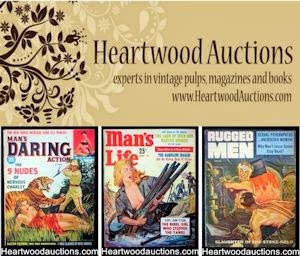 She appeared on many of the classic cover paintings Eastman created for the “sweat magazine” subgenre of men’s pulp mags, including MAN’S BOOK, MAN’S EPIC, MAN’S STORY, MEN TODAY, NEW MAN and WORLD OF MEN (published by the Reese and EmTee companies). On those covers, Eva usually “played” the iconic, scantily-clad damsel in distress being tortured by some evil Nazi or saved by some heroic GI. Often, the sadistic fiend or hero was modeled on Steve Holland — the favorite male model of Eastman and many other illustration artists in the 1950s and 1960s. In recent weeks, I’ve had the pleasure having an ongoing email dialogue with Eva about her varied and fascinating career as a model and actress. And, every week she has been surprising me with some new revelations. For example, although I was aware of her modeling work for Norm Eastman, I didn’t know she had also modeled for some other famous illustration artists of the 1950s and 1960s. 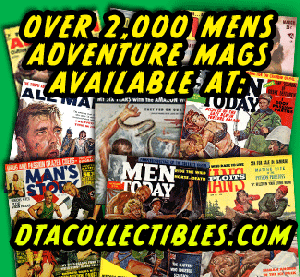 Then one day she sent me a photo of an age-browned, two-page interior spread from a men’s adventure magazine that she had pasted in the pages of an equally age-browned scrapbook. “I was the model for all of the women in this one and Steve Holland was the model for the men,” Eva told me. She also noted that the painting was by Al Rossi. It was used for the story “KIMONO GIRLS CHECK IN AGAIN” in the May 1957 issue of KEN FOR MEN, one of the Diamond/Atlas magazines published by Magazine Management. I asked Eva what she got paid for being an artist’s model in the late ‘50s. The most famous pulp paperback with a cover painting by Al Rossi is the 1953 Ace Double paperback edition of William Burroughs’ early novel JUNKIE (Ace D-15), published under the pseudonym William Lee. Rossi also did the cover painting for NARCOTIC AGENT, the book on the flip side of this now highly-valuable Ace double. Until Eva told me, I didn’t know she had modeled for Rossi and she had almost forgotten it herself. But as she looked back through her scrapbook, she recalled she modeled for Rossi during the same years she modeled for Eastman, during the periods when she lived in New York City from 1956 to 1958 and again from 1964 to 1968. As Eva and I began exploring some of Rossi’s work it became apparent that he had used her for both men’s adventure illustrations and paperback cover paintings. For example, Eva sent me a photo of another old tearsheet from a men’s adventure magazine that showed half of a two-page spread by Rossi, featuring a “close-up” of her. Though she didn’t recall what it was from, I was able to track it down. It was used for a cool, noir-style story in the February 1957 issue of Magazine Management’s flagship periodical STAG. Titled “LILY BRAZIL: WEEK-END GIRL,” it was excerpted from the 1956 paperback THE NAKED HOURS by Wenzell Brown. The novel featured a cover by Ray Johnson — another great illustration artist who did artwork for men’s adventure magazines during part of his career. That wild, highly-entertaining “love slave” yarn was originally published in the Summer 1956 issue of HUNTING ADVENTURES. 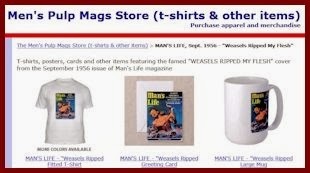 It’s one of the classic men’s adventure magazine stories included in the WEASELS RIPPED MY FLESH! anthology I put together with Wyatt Doyle and Josh Alan Friedman (recently published by Wyatt’s NEW TEXTURE publishing company). 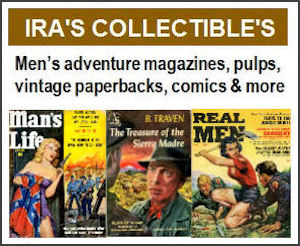 I’m currently working with Eva and men’s adventure art maven Rich Oberg to try to ID all of the men’s pulp mag illustrations by Norm Eastman and Al Rossi that feature Eva. Between Eva’s scrapbook and memories, Rich’s notes from conversations he had with Norm before he died, and the huge collection of men’s adventure paintings and magazines Rich owns, we have a good shot at finding most of them. Confirming the list of paperback covers that feature Eva as a model will be harder. “All the paperback books I had with me on the cover got ruined in a rainstorm when there was a leak in our garage a few years ago,” Eva told me. We do know that Eva was a model for quite a few of Al Rossi’s paperback cover paintings. In fact, Eva sent me a series of intriguing reference photographs that Al Rossi took of her alone and her with Steve Holland. Several of the photos Eva sent me clearly look like setups for pulp paperback covers. I haven’t been able to figure out which books they were all used for yet. However, I think I have IDed two of them. I suspect Rossi used a different shot from that session with Eva and Steve as his reference photo for the SUBURBIA AFTER DARK cover art. After some image searching online, I think I know. It looks to me like that photo came from the modeling session Rossi drew upon for his cover painting for THE EMPTY BED (1966), written by Louis Lorraine. I also believe Eva was the model for a gorgeous Al Rossi cover painting recently offered for sale on the Heritage Auctions site. It was used for the 1964 paperback STRANGE LOVERS, penned by Dan Bartell. Coming soon: more posts with illustration art and glamour photography featuring the great Eva Lynd. 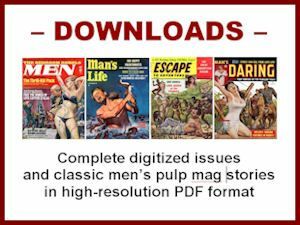 In the meantime, you can read “I WAS A LOVE SLAVE OF THE SAVAGE BLONDE” by buying a copy of the WEASELS anthology — or read “KIMONO GIRLS CHECK IN AGAIN” by clicking this link to download a PDF copy of the May 1957 issue of KEN FOR MEN from the MensPulpMags.com virtual newsstand.